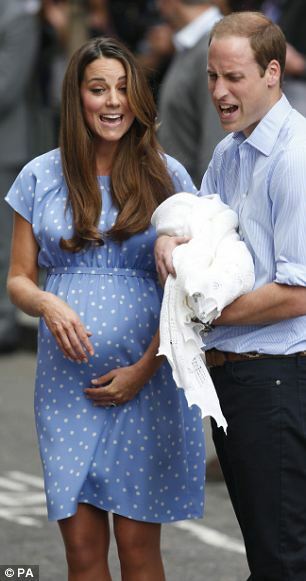 The recent appearance of Kate Middleton willing to (gasp!) show off that she still looked like a pregnant lady shortly after delivering her baby has brought a lot of cheers, jeers, and “so-what’s” — but no matter the emotional reaction, people are talking. For my generation, and I imagine anyone older, realizing a woman typically still looks pregnant after delivering a baby is as equally as shocking as seeing a real live newborn and realizing they look more like aliens than cute little bundles (I remember seeing the newborn of one of my best friends when I was in college and feeling a bit sorry for her that her baby looked so funny). Both of these startling facts, I believe, can be attributed to A) women previously hiding themselves from the media after delivering a baby (and who can blame them!) and B) portrayals on TV/movies of postpartum women (who are really just actors showing off their normal selves) and their cute “newborn” babies (who are really just three month olds posing as newborns). 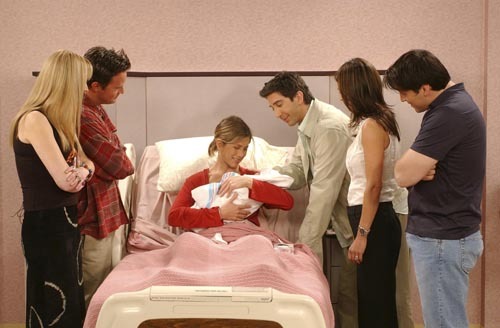 I mean, do you remember Rachel shortly after giving birth to Emma on Friends? 4.5 years ago, I helped throw a shower for a good friend having her first baby. She ended up having the baby a few days before the shower. She still looked pregnant. A woman came who had no children yet and commented, “I thought you had your baby?!?! ?” The rest of us who had children smiled knowingly–News Flash! Women still look pregnant after they deliver a baby. Most women on TV are just acting like they are pregnant. So when it is time to act like they are no longer pregnant, they look like an actress working in Hollywood. So why do we still look pregnant? In the book Your Pregnancy & Birth by The American College of Obstetricians and Gynecologists, it states, “Right after delivery, you will still look like you are pregnant. During pregnancy, the abdominal muscles stretched out little by little. They won’t just snap back into place the minute your baby is born” (page 195). It then goes on to say, “Give your body time to go back to normal” (page 195). Okay wait. Anyone here have their body go back to just how it was before the baby was born? Anyone? Not me! Not for any baby I have had. You hear tales of babies changing everything from hair texture to the size of your feet. So, yes, give your body time to go back to normal, but not the old normal, the new normal. I came to a crazy realization the other night as I sat around the campfire with my extended family and listened to my aunt talk about changes she is experiencing right now. As a female, you are born and you grow up like a “normal” person would. Then you get your menstrual cycle–aka period, Aunt Flow, the curse, surfing the crimson wave, monthly friend, on the rag, that time of the month…you get the drift. This is your new “normal.” You get to enjoy this normal for 5-20ish years in most cases before you encounter a new normal with the birth of your first child. With the birth of each child, you will spend some time figuring out what the new normal is for you. As you seek to find this new normal, you will have a vast array of hormones raging through your body, especially if you breastfeed. By the time you figure it out what normal is, you will likely have very little time to enjoy knowing yourself before the next pregnancy comes along. At some point, you stop birthing children and can once again enjoy 5-20 years of “normal” before you enter menopause. This is assuming you don’t have hormonal issues along the way. As women, our bodies are constantly changing. So use the word “normal” loosely when you fight to get back to it. This sounds very bleak, but there is a plus side. There is the new normal of being a mom. Your body did some amazing things, and changed though it is, it can be stronger! It has shown you what it is made of and what you are made of and you are better for it in every way. Your postpartum body is definitely different from what you are used to as “normal,” but with every baby and every shift, you are more refined and better for it. thanks for sharing this – spot on! and of course there are other positives of having gone through pregnancy, like lower risks for cancers, etc.. in fact, i just a read a study recently that linked breastfeeding to lower rates of alzheimer's-like dementias. go, mamas, go!!! I love this. I was just thinking about this last night, actually. Men would never allow themselves to feel so down on their bodies and pressured to look good quickly (or maybe ever) after having babies, if they were the ones that had them. I imagine many of them would say, "Uh, I just grew a whole human in my body! I am amazing!" and then dig into some cake, or steak, or whatever. I'm not saying we shouldn't strive to be healthy or, as you said, that the new normal can't be great too. But I definitely agree that all women can contribute toward recognizing the miracles of our bodies and portraying that as the amazing, positive thing it is!! kmbutrfly, that is a great point about the benefits so far as many diseases go. So true Katie, and I think it is mostly women who are pressuring each other with getting "back in shape" and pressuring themselves. I mean, most women aren't going to go to a good friend an tell her she needs to get back in shape faster or she got back in shape too fast, but I think when we remove ourselves and look at it through social media and as spectators watching through the media, we suddenly start judging such things.